Indian authorities last week detained more than 20 Tibetan independence supporters who protested against Chinese Premier Wen Jiabao's visit to India. Mr. Wen has come and gone, but India's hosting of the Tibetan exile community, which is nearing a major political milestone, remains an irritant in the two countries' relationship. In Dharamsala, India, Tibetan musicians pay tribute to political prisoners held by China and Tibetan Buddhist devotees sing a daily prayer for the safety of their spiritual leader in his travels. 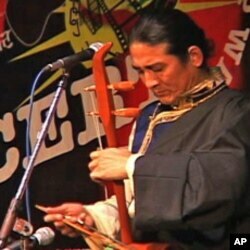 Exiled Tibetan musicians at a concert, Dec. 14, 2010. Such activities would invite severe punishment for the six million Tibetans living under Chinese control, but in Dharamsala, it is just another day. This quiet corner of the Himalayas has been the Dalai Lama's home for most of the 51 years since he fled across the Indian border in 1959. By hosting him, India has incubated not only one of the world's most recognizable celebrities, but also a political process. His Holiness, as followers call him, has slowly delegated political power away from himself and towards a democratic administrative structure. Its task is to care for the more than 130,000 Tibetans in exile, and to seek reunification with their historic homeland. This March, the Dalai Lama, now 76-years-old, has indicated he will formally request that members let him retire from political duties. Tibetan exile officials, including current Kalon Tripa Samdhong Rinpoche, are anxious about that. "We all at this moment are concentrating to one point," Rinpoche says. "How to persuade his Holiness not to withdraw." No other Tibetan enjoys anything approaching the world fame of the Dalai Lama. And no one else, says Rinpoche, has the same influence over Tibetans. "His Holiness is the binding force for all the Tibetan people. As the torch of light, or the leader, he must be there," says Rinpoche. "Otherwise, the elected person alone cannot take the responsibility. That much I know." Many suspect the Dalai Lama is seeking retirement not out of a desire for a rest, but as a way of pushing Tibetan exile democracy to be more self-reliant. He has always said he wants to step out of the way and let democratically elected officials handle Tibetan affairs. A more democratic Tibetan community may become more contentious, paving the way for possible challenges to the Dalai Lama's vision of a democratic Tibet living autonomously under Chinese rule. Tenzin Chokey of the Tibetan Youth Congress. Tenzin Chokey of the Tibetan Youth Congress says Tibetans should demand more than just autonomy. "Tibetan independence is the ultimate resolution to the problem," says Chokey. "We cannot sit and wait for China to talk to us. Stop using the soft power, we need to get a little more aggressive than that," she says. Tibetan frustration boiled over visibly in 2008, when protests erupted across Chinese-controlled Tibet. It is unclear what effect a diminished role for the Dalai Lama will have on such emotions. 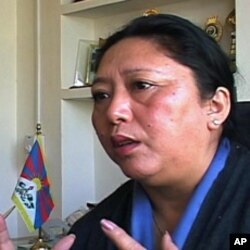 Deputy speaker of the Tibetan Parliament in exile Dolma Gyari. Deputy speaker of the Tibetan Parliament in exile Dolma Gyari says if His Holiness insists on stepping away from politics, it will put added burdens on the next Kalon Tripa. "It has to be a leader who is not only good in governance, but who's good in uniting the strength of the people inside and outside of Tibet, and taking them forward together," says Gyari. After the Dalai Lama passes on, Tibet's administration will have to make due for 15 years or more while their tradition selects a reincarnated Lama, and raises him or her through childhood. That gives the exile government a strong incentive to master the art of self-reliance.